An easy one-pan meal that is finished in 30 minutes. 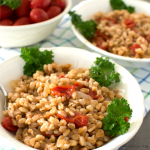 The farro keeps its chewy texture while the onion-tomato seasoning soaks into each kernel. 1 cup farro -- check what type it is for cooking time. I used Italian pearled farro which cooks in about 20 minutes. 1/4 cup grated parmesan cheese and a little extra for sprinkling on top. Place the water in a medium saucepan. Put the farro in a sieve and rinse with cold water. Add the farro to the water and let it presoak about 5 to 10 minutes while you prepare the other ingredients. Once you slice the onions add them to the pan as well as the thinly slice garlic cloves, salt, red pepper flakes, Italian seasoning, and 1 tablespoon of olive oil. Set the timer for 30 minutes. Bring the uncovered pan up to a boil. Halve the grape tomatoes and add them to the other ingredients. Once the the liquid comes to a boil, reduce it to a simmer, stirring occasionally. When the timer rings, the farro should be cooked, tender but still chewy. The water should be almost completely absorbed. Stir in the grated parmesan cheese. Transfer the farro to a serving bowl. There may be a little extra water left but we believe it adds to the taste. * If you don't have basil you may use Flat-leaf parsley. We've done it both ways and both ways are delicious but the basil adds more flavor. This recipes was inspired by Deb from Smitten Kitchen who in turn was inspire by Martha Stewart Living.